Ever wondered which state has been having a good run of lottery luck? Try Indiana. Watch the video to see people who have won hundreds of millions through the Powerball Lottery. 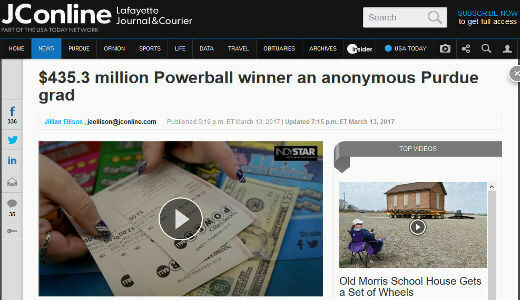 The latest winner of a big Powerball jackpot in Indiana has been announced, although the winner does not wish to be identified. A representative for Powerball can confirm that the winner of a $435.3 million jackpot is a Purdue graduate who lives in the Greater Lafayette area. He is further described as a middle-aged man who has resided in the state for a decade and considers Lafayette home. The winner is also said to have expressed his gratitude to both the Hoosier Lottery and the community. The winner, who is said to have bought the ticket on the date of the draw, has no concrete plans for the money. He can only say he will give to family and also to charity. He has not even decided if he wants to keep on working!